Energy Systems Southeast offers the complete line of Generac mobile products including mobile lighting, power, water, pump and heat solutions. Generac’s mobile products are designed for their ease of operation, efficiency and enhanced job safety and give you the reliability you can trust on any job site. Generac mobile light towers come in a number of different configurations including LED, Metal Halide, Vertical Mast, Horizontal Mast and Zero Emissions Units. Generac Magnum MLT6 series mobile light towers provide maximum lighting and power in a minimal footprint. The MLT6 series towers set up in just one minute with a rear flip hood that provides unobstructed service access. 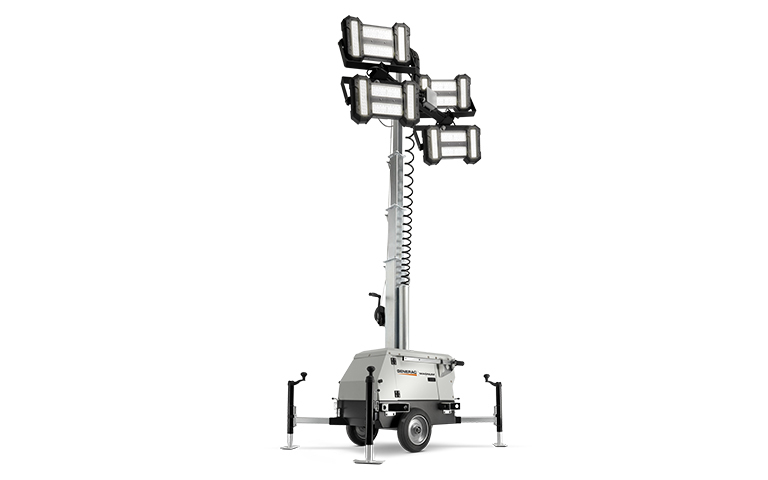 The long-time, proven standard in light towers, Generac Magnum 3000, 4000 and 5000 series light towers provide dependable lighting in a robust powder-coated steel enclosure. They are available in vertical and horizontal mast models. The new PLT240 LINKTower is a unique portable lighting solution for a wide range of jobs, events and projects – both indoors and out. Find out more about the new LINKTower in the article below. Generac mobile generators come in diesel or gaseous fuel configurations. The diesel line is available from 8-2000kW while the gaseous lineup goes from 155 – 450kW. Durable, sound attenuated enclosures provide quiet operation, suitable for a variety of applications and environments. For really large mobile power needs, Generac containerized generators provide up to 2MW of power – and can be customized to your specifications. With the lowest suction height in the industry and final tier 4 engines, Generac Magnum trash pumps are designed for ultimate performance. A choice of wet prime and dry prime models allow you to specify the perfect pump for your needs. All models handle water and solids up to 3 inches (76.2 mm) in diameter, and operate for extended run times. Generac has mobile heaters designed for a number of specific applications. Flameless heaters are ideal for jobsites where an open flame is prohibited. The Hydronic Surface heaters provide up to 630,000 BTU’s to warm ground, concrete and other surfaces. For construction site, the Indirect Fired heaters come in a range of sizes offering 400 to 4.2 million BTU’s of heat. Generac offers two mobile water solutions – one is an easily maneuverable 500 gallon water trailer. The second is an innovative combination utility trailer offering up to 19 kW of power, metal halide lights and 500 gallons of water. To learn more about the full line of outstanding Generac mobile products, please visit our website. The Generac LINKTower is a unique product in the marketplace. You don’t tow it, you transport it – retractable folding handles, caster wheels and compact mast stowage make for an easy, one person setup. It’s powered by standard 120 volt shore power – making it a clean and quiet solution for any application where sound is a concern. Generac is the largest manufacturer of light towers in the world. The LINKTower is yet another innovative product perfect for a variety of applications. To learn more, download the brochure here, or contact your ESSE sales representative. We invite you to visit the Energy Systems Southeast Booth at the Atlanta Build Expo, July 12th and 13th at the Georgia World Congress Center. We’re located in Booth #314 – with info on all of Generac’s great mobile power products. Contact your Energy Systems sales representative for free passes to attend the show! For more information about the show click here.